Have you been looking to extend your living space as well as spend more time outside? With a sunroom from Allmaster Home Services, you can do both. 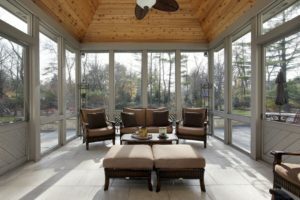 Allmaster has been providing sunroom installations to homeowners throughout the Towson, Maryland, area since 1987, creating spaces to enjoy the outdoors from the comfort of the indoors. When you select us to install a sunroom, you’ll be getting a dependable structure with a sleek design that you and your family will enjoy for years to come. Sunrooms installed by Allmaster are manufactured by industry leader BetterLiving Sunrooms, and are made from state-of-the-art, reinforced vinyl. This ensures that your sunroom will never warp, rot, peel, or need to be repainted. Additionally, Allmaster sunrooms can be heated or cooled for use in most weather conditions. The windows and doors are also energy efficient because they are made from argon-filled, low E, double-pane insulated and tempered glass, therefore minimizing heat transfer between the outdoors and the interior of the sunroom. This means less work will be needed from your HVAC unit and will potentially lower your monthly energy bill. Contact Allmaster Home Services today to learn more about our sunroom installations and to receive a free quote. We proudly serve residents of Towson, Maryland, and surrounding communities.